It’s about as regular as clockwork. Every time there’s another mass shooting, the gun control crowd talks about restricting the Second Amendment; enacting what they call “common sense” gun law. The only thing is, those laws are only common sense to those whose main goal is to take guns out of the hands of law-abiding citizens. As we all know, those laws aren’t going to stop criminals and are only going to criminalize honest, hard-working Americans who want to keep their guns. There are two results of this political posturing. One is an increase in gun sales. People become afraid that they won’t be able to buy their favorite gun and so rush out to buy it before it becomes illegal. Does anyone really think that these people are going to peacefully turn over their guns, just because a law is passed, outlawing them? Former President Obama can justly be called the firearms industry’s number one salesman, for the massive number of gun purchases that his anti-gun rhetoric caused. Had Hillary Clinton won the 2017 Presidential Election, we would see that continuing. But with Donald Trump in the White House, gun sales have entered into a slump. Even so, they still spike every time the gun grabbers start pushing new legislation to take away our guns. The other thing that happens is that the gun owners in the country start looking for ways to hide their guns. After all, if it’s going to become illegal to own those guns, there’s a chance that the government will start trying to round them up. If that’s the case, then of course none of us want them to find where we keep them. To have them available for use, in case of home invasion. To hide them from thieves, children and others who shouldn’t get their hands on them. So, if we’re going to take a look at hiding guns, we really need to look at all three reasons for hiding them, as well as what will work in each case. While there are some ways of hiding them that might work for more than one of these three reasons, there are others which might be perfect for one of them, but not work for another. 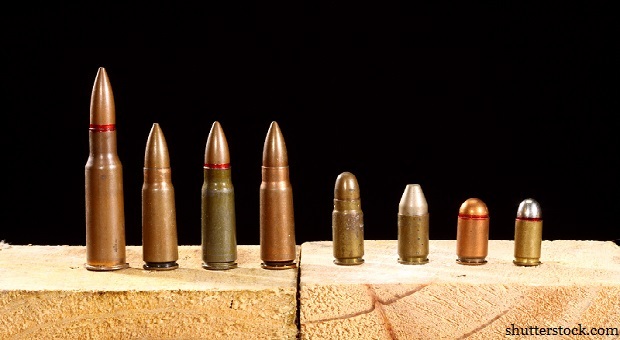 Ideally, you’re probably going to want to use a combination of methods for hiding your guns, keeping some available (but hidden) for home defense, while others are stashed away where no government agent is going to find them. That means having enough guns to meet both needs, but that’s not an issue for most of us, as most gun owners have multiple firearms in their collection. From that point of view, it makes sense, but not from any other. First of all, criminals know that most of the valuables in any home are kept in the master bedroom. That’s’ where they are going to find jewelry, guns, collectibles and other lovely trinkets that they can take to their local fence. So from the point of view of keeping your guns safe from criminals, the entire master bedroom, including the closet, should be considered off limits. That’s not to say that there is no value in having a gun in the nightstand, ready for use in the middle of the night. I place my holstered pistol on top of my nightstand, when I undress at night. But I don’t just leave it there; I wear it every day, carrying concealed. Actually, carrying a gun concealed is the best place for hiding a pistol, if you are planning on using it for self-defense or home defense. That gun in the nightstand is only going to be useful if you happen to be in bed, or at least in the bedroom, when the bad guys come knocking on your door. I can guarantee you that if you’re sitting in the living room, watching the television when they break in, they’re not going to wait for you to go to your bedroom and grab your gun. They’re going to attack you before you can do that. Some people feel uncomfortable carrying a gun around at home, I can understand that. I was, until I became used to it. It always seemed a bit melodramatic to be armed at home; until I started looking at home invasion statistics and understanding how little time I would have to react. Okay, but what if you don’t want to carry at home, what then? If that’s the case, you want to keep guns in places where you frequent, so that they are readily available to you if you need them. If you have a favorite chair that you use while watching television, then make sure you have a gun located where you can reach it, without getting up from that chair. Attaching a holster to the back of the adjacent chair or in an end table drawer works well for this. If you spend a lot of time in your home office or workshop, keep a gun there. Attaching a holster to the underside of the desktop, so that it can be reached while sitting at the desk is an old trick, which you’ve probably seen in a movie sometime. But there are easier ways of doing it, like hiding a pistol in a desk drawer or a drawer of your toolbox. Picture frames which hinge open, with space to hide a pistol inside. Coffee tables with drawers that are custom fitted to your guns. Coffee tables with tops that split or slide open, revealing a place fitted for hiding guns. Entertainment centers and china cabinets that have end caps that swing open to reveal gun storage. Knick-knack shelves with hinged tops that open to reveal a place to hide a gun. Keep in mind that you are hiding these guns to be readily usable in an emergency. That means that you’re probably going to want to keep them loaded at all times. You should also keep a full spare magazine with the gun, just in case you need more ammo, as well as a good tactical light. While most criminals won’t bother, some will try and cut your power, before attacking your family. There’s a bit of a contradiction here, between keeping hidden guns which are loaded and ready to use, and keeping your kids safe. The last thing any of us want is for one of our kids to kill a sibling or friend, fooling around with our guns. But the risk of that happening is real, if we have loaded guns in the house. Of course, this risk is minimized by carrying the gun, so that you always have it under your control. That’s part of the reason why I carry at home. I always have my gun, so I can protect my family, yet I don’t have the risk of anyone finding a loaded gun, supposedly hidden away where I think it is “safe.” Safe to me, means under my control. Don’t think that not telling your children where your guns are is enough. Children see much more than we expect them to. If you have one of those coffee tables which has space to hide your guns, you can be sure that they will be curious enough to try and figure out how to open it. The only real protection for your children is to teach them about guns. 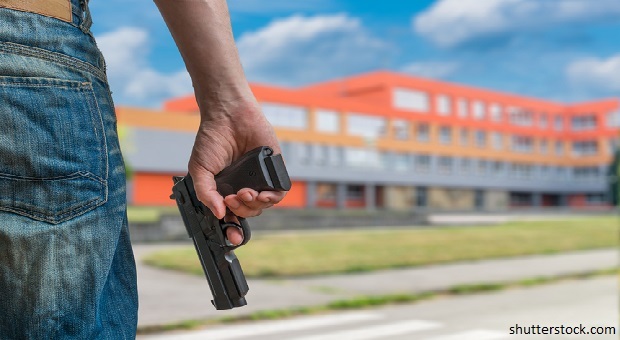 Children who have a healthy respect for guns, including an understanding of gun safety and a knowledge of how to shoot, don’t mess around with guns, accidentally shooting their friends with an “empty” gun. They will treat all guns with respect, as if they are loaded, and check to make sure that they are not before handling them. That’s safe. 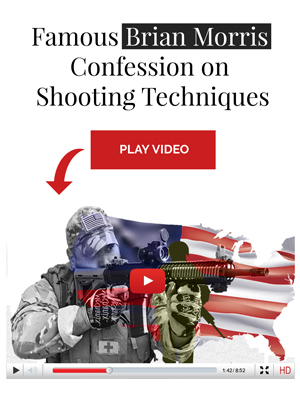 Everyone in your family who knows how to shoot, should know where you have your guns hidden. That way, if you are not there, they have the ability to defend themselves. This also allows them to help ensure that other people, such as small children, don’t end up finding those guns. 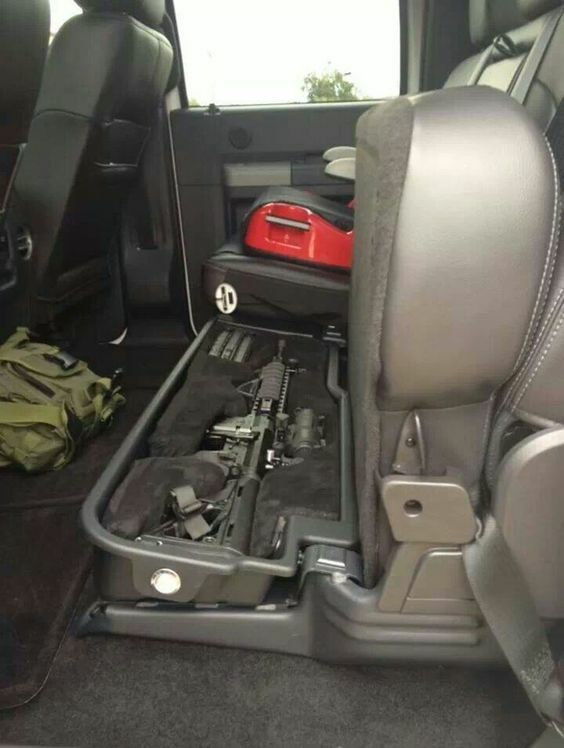 While it’s not part of your home, you may decide to hide a gun in your car for defense. This is actually one of the few places where carrying a gun in a holster for self-defense is totally impractical. Try drawing an unloaded gun out of a holster in a car sometime. You’ll find that it’s not all that easy to do. 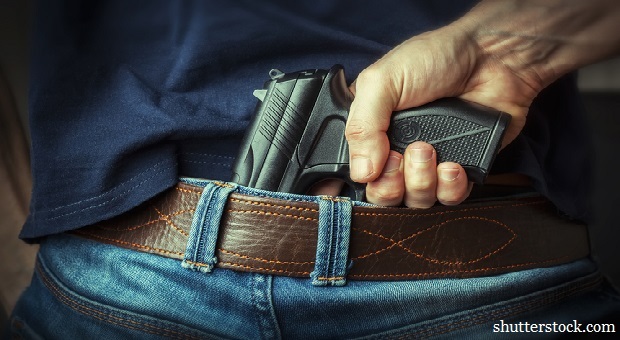 You’re better off having that gun in a holster attached to the front of the driver’s seat or under the driver’s seat, where you can reach it while driving. In some states, you are allowed to carry a loaded gun in your car, even if you don’t have a concealed carry license. But, in those cases, you usually have to have the gun concealed. So make sure that the holster you choose keeps the gun out of sight. Another reasonably good place to keep a gun hidden in a car is in a center console. This keeps it fairly accessible, while hidden, assuming you don’t have your console filled with junk. There are a few companies that make holsters just for this, which I highly recommend. Putting a gun loose in the console carries the danger of you hitting the trigger accidentally, while searching for something. By putting the gun in a holster, you keep that from happening. Hiding your guns from the government is a totally different animal than hiding them for defense. I seriously doubt that any government agents who are searching for guns won’t already know about every type of furniture there is that you can hide guns in. They’ll also have a pretty good idea about the various ways that you can make your own methods of hiding your guns in your furniture. So I would avoid furniture totally for this purpose. Without getting into major work, there are a few places where you can probably hide guns, which will be missed by the average search team. I wouldn’t want to count on these for everything. But hiding a couple of guns in this manner would keep them more accessible, while making the search team think that they’d found your hideaways if they find them. Few people look up, at the space above the door, on the inside of the closet, when searching a closet. You can hang a rifle or pistol above the door and it probably won’t be seen. Speaking of closets, you can use the space in the closet walls for storage by building a box and insetting it into the wall. I’m talking about the inside of the wall that adjoins the room here, so that they would have to go into the closet and look out to see it. If you have boxes of things stored in the attic, you can probably hide a gun or two in the bottom of boxes that have baby clothes or children’s toys, without much trouble. In reality, you can pretty much forget about keeping these guns accessible and hidden at the same time. That’s just not going to happen. If your home gets searched in a gun confiscation, you can expect that they will take all the guns you have set up for home defense. That’s when you’ll need to turn to these guns. The idea here has to be to put the guns in places where nobody is going to expect them to be; in other words, secret compartments. But don’t think you can make secret compartments that are readily accessible. Rather, plan on shutting these guns away forever, unless you need them. Where you end up hiding these guns will depend a lot on your skills as a handyman. Any of the following ideas will work well, if the idea is well executed. What you want is to make these hiding places in such a way that nobody can tell they are there. That way, they won’t think to see what’s inside. The space inside your walls could hide an entire arsenal. All you need to do is cut off the drywall on one side of the wall, place the guns inside and then replace the drywall, finishing, texturing and painting it to match the room. But take care to ensure that there is no obvious line around the edge of the opening or someone might decide to look inside. Fake ductwork can be a great hiding place. Few people understanding the HVAC ductwork in a home. So buy the same sort of material that your ductwork is made of and add some additional, making it look like it actually goes to something. You can hide guns, ammo and anything else you want inside. Speaking of fake ductwork, fake vents or registers can be installed, giving access to the inside of the walls. Just take care to ensure that the items you have hidden can’t be seen though the vent. Just like fake ductwork, fake plumbing can be created in the basement. If your basement is unfinished, you probably have a four inch diameter PVC drain pipe somewhere in it, perhaps more than one. Adding an additional four inch drain is fairly easy, and if done properly, few people would recognize it for what it is. Guns can be hidden inside. PVC pipe can also be used to make a gun safe for burial underground. So can five gallon plastic buckets. Just be sure that you dig the hole someplace you’ll be able to find again. One of the things you want to do, if you are going to hide guns in this manner, is to make sure that you don’t hide them all in one place. Rather, hide them in various different places, so that if one gun is found, hopefully others won’t be. Always make sure that any guns you hide from the government are hidden with everything you’re going to need. That means any optics, magazines, cleaning supplies and ammunition (lots of ammunition), as well as common spare parts for repairing your guns.